Statue of architect Kazik presented to Relics Preservation InstituteVietNamNet Bridge – A head statue of Polish archaeologist and architect Kazimierz Kwiatkowski, known as ‘Kazik’ (1944-1997), who significantly contributed to preserving many Vietnamese heritages, was presented to the Relics Preservation Institute of the Ministry of Culture, Sports and Tourism on Tuesday. Polish architet Kazik (centre) poses with his friends in Hoi An ancient town. According to director of the institute Hoang Dao Cuong, the event aims to commemorate Kasik’s contribution to Vietnam as a relics restoring specialist. The terra-cotta statue of Polish architet Kazik, created by renowned Vietnamese sculptor Pham Van Hang, was presented to Relics Preservation Institute, the Ministry of Culture, Sports and Tourism on Tuesday. A statue of Kazik was installed in a park named after him on Tran Phu Street, Hoi An in 2017 to mark his 20th death anniversary. $58b for North-South high speed train: consultantsVietNamNet Bridge – Vietnam’s first-ever high speed train running from Hanoi to HCM City is projected to cost more than US$58 billion, project consultants unveiled on Tuesday. The consultants said that the high speed railway would best attract passengers and be able to compete with the soaring aviation sector if trains run at a maximum speed of 350km per hour. With such a high speed, travel time between Hanoi and HCM City will be cut dramatically to approximately 4.5 hours, compared to the current 30 hours on the train and about one hour and 40 minutes by air. ‘Huge risk’Viet Nam Bridge and Road Association vice president Nguyen Ngoc Long called the North-South high speed railway a mega-project at the same time as Vietnam is investing in other colossal projects like the North-South Expressway and the aviation development plan. “Speed proposals should also be considered carefully, but whatever is selected must guarantee the standard speed of 350kph,” he said. Teacher shortage clouds school yearVietNamNet Bridge – With the new school year approaching, 43 cities and provinces across the country are facing a shortage of teachers. Crowded classrooms: The new school year is approaching but the country is still lacking nearly 76,000 teachers at different education levels. The most serious shortage is seen at the kindergarten education level, which lacks 40,000 teachers, said Nguyen Thi Nghia, deputy minister of education. Nghia said the shortage is seen in many localities, especially Dien Bien Province and the Mekong Delta region. Meanwhile, there are shortage and surplus of teachers at various secondary and high schools. Taxi stands piloted in HCM CityVietNamNet Bridge – In an effort to prevent taxis from driving around to pick up passengers and causing traffic congestion, at the beginning of this month the HCM City authorities launched a pilot programme placing five taxi stands at five locations in the downtown area of District 1. And putting up taxi stands is one of the sensible measures, in my opinion. Citizens should be given some incentives to actually go hail taxis at taxi stands when they can do it anywhere else. Some people said the five current stands in HCM City were not really accessible to most passengers. Like any other new idea, it will take a while for taxi stands to earn their stripes in HCM City, and later on across the country. Bad debts landscape at small banksThere has been great variations in small-scale banks’ bad debts performance in the first half of the year, with some showing great improvements, while others struggle to cope. Apart from banks that saw positive developments in their bad debts, several other banks reported a worsening situation. A typical case of sharply rising bad debts among banks of modest size was Saigon Bank whose bad debts ratio surpassed 6 per cent at the end of June 2018, while the limit set by the state is 3 per cent. Since its establishment in October 2013 to the end of 2017, VAMC, dubbed as Vietnam’s bad debt bank, succeeded in recouping about VND81.5 trillion ($3.6 billion) of bad debts out of the VND307.9 trillion ($13.6 billion) total principal bad debt volume. Apart from banks that saw positive developments in their bad debts, several other banks reported a worsening situation. Ministry of Finance tops Vietnam ICT Index for six consecutive yearsThe Ministry of Finance has topped 19 governmental agencies with public services in the Vietnam ICT Index for six years in a row after earning 0.926 points this year. The ministry has topped Vietnam ICT Index for six consecutive years. The ministry ranks first in ICT human infrastructure (1.000 points), ICT applications (0.900), and internal ICT applications (1.000 points). The Vietnam ICT Index 2018 was compiled by the Ministry of Information and Communications based on the United Nations’ criteria. The survey gathered data from 63 provinces and cities; 19 governmental agencies with public services and five without public services. Mekong Delta provinces take action to ensure safety during flood seasonVietNamNet Bridge – Provinces in low-lying areas in the Mekong Delta are at risk of heavy flooding due to water from upstream coupled with quickly rising tides, especially in Kien Giang, An Giang, Dong Thap and Long An. — VNS PhotoThe National Centre for Hydro-Meteorological Forecasting, which said that water levels in the Mekong Delta are rising at alarming levels, has issued a warning level of 2 and 3. However, by August 31, floods are expected to rise to 4.2m at Tan Chau Station and 3.7m at Chau Doc Station, surpassing the warning level 2 by 0.2m. Meanwhile, downstream areas could reach warning levels of two and three, and some places surpassing level 3. 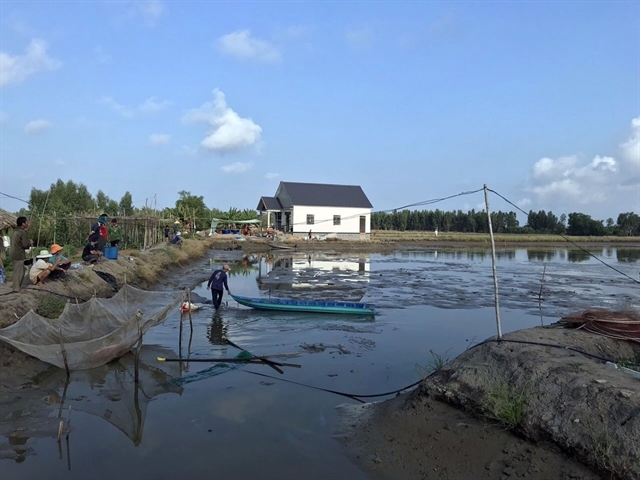 Kim Ngoc Thai, vice chairman of Tra Vinh Province’s People’s Committee, said since the beginning of the year, high tides have damaged several roads in Tra Vinh City and Tieu Can District’s Tan Hung Commune. Int’l stars perform in HanoiVietNamNet Bridge – Soul Bar Hanoi will organise nights of live music featuring international artists, free of charge. A jazz/folk concert featuring Felipe Salas Sandoval will take place on September 1. Naomi is an emerging singer songwriter and is accompanied on acoustic guitar by her brother who plays with a very original and rhythmic style. A jazz/folk concert featuring Felipe Salas Sandoval will take place on September 1. Soul Bar is located at No 21, Lane 12 Dang Thai Mai Street, Tay Ho District. Ongoing rains pose risks of flooding and landslides in the northVietNamNet Bridge – Ongoing heavy rain since early this week has caused damage in northern provinces. Landslide causes difficulties for people to travel on National Highway 12 from the northern province of Lai Chau to Dien Bien. — VNA/VNS Photo Cong TuyenIn Son La Province, a landslide occurred on National Highway No279D in Muong Bu Commune, Muong La District early Wednesday morning, blocking traffic. At least 15 houses in Muong La District have been affected by the flooding, of which, ten families were evacuated to safety. Landslides disrupted traffic on a number of routes, especially National Highway 4H from Muong Cha District to Muong Nhe District. Railway sector strives for better serviceVietNamNet Bridge – Train travel is falling behind other forms of transport, as passengers are choosing air and roads ahead of the tracks. During 2001-10 period, investment in railway sector accounted for only 2.9 per cent of total budget invested in the transport sector, while investment in road improvements made up for 88 per cent. Between 2010 and 2015, State budget allocated for railway accounted for 3 per cent out of VND330 trillion invested in the transport sector. For the railway sector, one new route will make the carrying capacity to increase by 20. “People of the railway sector should change their own mind. Judge rules Utah woman legally married to deceased partnerA Utah state judge has declared a 74-year-old woman and her long-term lesbian partner legally married, three months after her wife died. -- Photo: BONNE FOERSTERJudge Patrick Corum declared Bonnie Foerster legally married to Beverly Grossaint, who died in May in Salt Lake City at age 82. "My heart was so full with love," Ms Foerster recalls of the 21 August ruling. Judge Corum "came down from the bench and hugged me and said, 'yes you are married,'" Ms Foerster told the BBC. Escaping an abusive husband, Ms Foerster said she was suffering from broken ribs, and wore dark sunglasses to conceal two black eyes. Why a village in New Zealand is trying to ban all catsA small village on the southern coast of New Zealand is planning to implement a radical plan to protect its native wildlife: ban all domestic cats. In Omaui, officials say the measure is justified because cameras have shown roaming cats preying on birds, insects and reptiles in the area. 'Natural-born killers'It's not the first time cats have been painted as a menace in New Zealand - a country boasting a feline in almost half its households. They're a hot issue in Australia too, where feral and outdoor cats are blamed for millions of native species' deaths every night. Last year animal rights groups laid particular scorn at one Queensland local council who were offering $10 bounties for feral cat scalps. Ha Long suspends licenses of 36 cruise shipsHa Long City authorities have suspended the licenses of 36 cruise ships and 15 crew members working on the Ha Long and Bai Tu Long bays so far this year. Cruise ships in Ha Long Bay. The city government asked the owners of the cruise ships to promptly comply with the requirement to ensure the safety of tourists visiting Ha Long and Bai Tu Long bays. According to the Ha Long City People's Committee, there are now 504 cruise ships and 68 canoes operating on Ha Long and Bai Tu Long bays. The provincial leader also asked Ha Long City to build a tourist centre in Tuan Chau International Port. Instant noodle business rebounds after a slumpVietnam’s instant noodle market is once again positioning itself as a fertile ground for both local and foreign producers, as instant noodle sales recovered in 2017 after two consecutive years of decline. Vietnam’s instant noodle market reached its peak between 2012 and 2014, with 5.2 billion packets sold. Masan Consumer, which produces the popular Omachi brand, also saw a recovery in its instant noodle sales up 16. At the peak of the instant noodle market in 2014, KIDO Group made its debut with the Dai Gia Dinh brand. In addition, it had not built a stable output, which is an important factor ensuring low costs for its instant noodle products.